Consistency matters. It matters if you want to bet on the Kentucky Derby, and it matters if you want to win the Kentucky Derby. That’s why He’s Had Enough is one of the early favorites on Bodog’s Derby futures market at 20-1, despite having yet to win a race other than his maiden. This Kentucky-bred roan (referring to his gray color) features the same owner, trainer and jockey who hit the jackpot last year when I’ll Have Another won the 2012 Kentucky Derby. These are obviously not very good results. However, the one race of the five that matters most is the Juvenile, which was the only race of the five on a dirt track. The Juvenile also featured some of the best 2-year-olds on the planet; He’s Had Enough finished a very close second to Shanghai Bobby despite having the longest odds of the nine-horse field at 20-1. He’s Had Enough also offers a high-end pedigree. Tapit finished a disappointing ninth to Smarty Jones at the 2004 Kentucky Derby, this after winning the Grade 1 Wood Memorial in his final prep race. However Tapit has enjoyed a decent second career as one of the most sought-after stallions in Kentucky, standing at Gainesway Farm in Lexington and commanding a $125,000 stud fee. His progeny includes 2008 Breeders’ Cup Juvenile Fillies champion Stardom Bound, and 2011 Breeders’ Cup Juvenile winner Hansen. The dam is Amelia, who herself was the product of Dixieland Band, the 2004 winner for leading broodmare sire in North America (and the son of 1964 Kentucky Derby winner Northern Dancer). 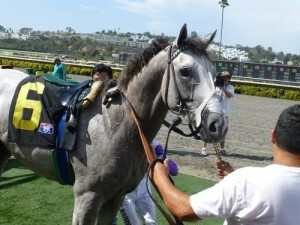 Amelia has also produced 2012 Grade 3 Sycamore Stakes winner Kindergarden Kid. This pedigree suggests that He’s Had Enough will be able to handle longer-distance races in 2013. The 2012 Kentucky Derby-winning trio in question consists of owner Paul Reddam (Reddam Racing LLC), trainer Doug O’Neill and jockey Mario Gutierrez, who took over for Garrett Gomez when He’s Had Enough left Del Mar. Reddam purchased the colt as a yearling for $200,000; the Canadian has enjoyed previous success with 2004 Breeders’ Cup Juvenile champion Wilko. O’Neill has some work to do to get He’s Had Enough prepped for the Kentucky Derby. It has yet to be determined as we go to press where He’s Had Enough will race next, although it’s very likely not to be on a synthetic surface. A return to Santa Anita for the Grade 1 Santa Anita Derby could be in the works – that would earn He’s Had Enough a cool 100 points on the Road to the Kentucky Derby. Keep a close eye on this prospect to see how he starts the New Year.